We have a clear and exciting vision for the future. A vision that has driven us from the moment the original idea of turbine aerator has come from the brilliant mind of innovator and visionary Alfred Zajič. He turned his dream for a cleaner environment into reality by creating one of the most efficient water aerators up to this day. Our future is about following that path and creating the kind of excellence that comes from a unique combination between sophisticated design and outstanding performance. In order to achieve these results we push the limits, exceed the expectations, and with each new product we expand boundaries of possibility. The future awaits, with new products, new projects and no limits. Tina is a CEO and she has built a successful business from the ground up, selling innovative products to the global market. As an effective leader of excellent team she has credibility, competence and caring. 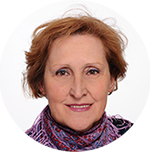 Xenia is sales specialist with over 30 years of management experience. Working for some of the largest Slovenian companies she has acquired a great knowledge which complements the dynamic business environment of our company. Damir enriches our team by working on core principles of analytics, project management implementation, organizational management, process configuration mapping and workflow analysis. Sergej fearlessly leads our R&D department, and together with our engineers as a product developer is responsible for new exiting products. With a deep insights in the needs of our customers he brings ideas to life. Tomaž as a production managers ensure that manufacturing processes run reliably and efficiently. By selecting, ordering and purchasing the best materials on the market, he take care that all products are perfectly made to the highest customer satisfaction. Vilma provides professional services with excellent advanced business skills in order to reduce unnecessary costs of the company and, through its practical knowledge, introduces new methods in the purchase and sales process. We always put our clients first, investing time to understand their needs and providing them best solutions on the market. Thanks to our innovations we help our clients to stay ahead of the curve in a volatile market. Sharing our extensive knowledge and experience in aeration system design through projects around the world. We strive to positively impact our environment and minimize human footprint on the planet by carefully designing our products.